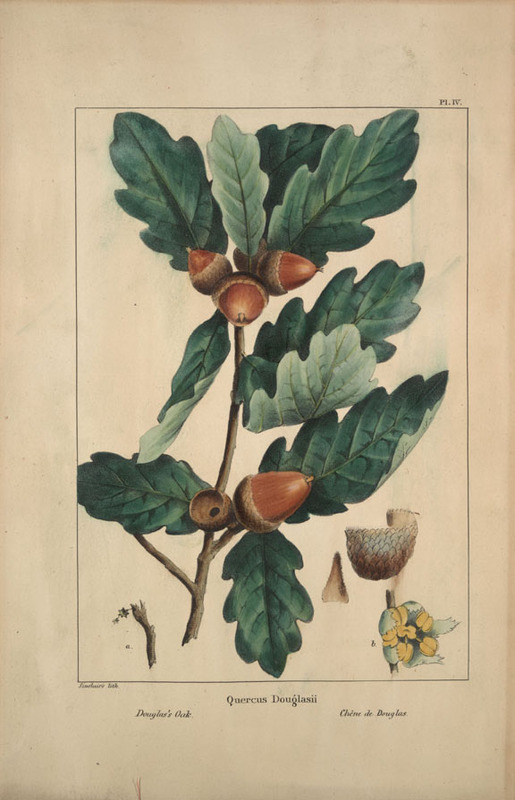 "Quercus Douglasii," by Andre Michaux, 1813.
Credit: Ewell Sale Stewart Library, The Academy of Natural Sciences of Philadelphia. French botanist Andre Michaux discovered and classified dozens of new plant species during the twelve years he traveled through the woods of North America searching for plants that might do well in the royal gardens of France. A decade before the Lewis and Clark Expedition, Thomas Jefferson commissioned him to lead an expedition to the Pacific Ocean. This illustration of an American oak first appeared in his Histoire des arbres forestiers de l'Amerique Septentrionale, (1810-1813).